I had a call from a customer complaining of black smudges on her clothes, she thinks from her washer. She also reported that her dryer needed service because it made an awful noise. 2) Rubber and/or metal filings from a wallowed out drum roller in the dryer getting on the clothes. In this case, you’ll see amorphous smudges instead of well-defined, circular spots. As you can see, the drum roller is nuked. Amazingly, the roller shaft was still serviceable. If you looked at the larger view, you may have noticed all the metal shavings on top of the motor and piled in the back corner. With the drum roller so wallowed out, the rear drum seal was sloppy and would let metal filings into the drum while the dryer was running. These metal filings get on the clothes and leave black smudges. I replaced both drum rollers, the belt, and the idler pulley. Since this was a Whirlpool-built dryer, these parts all come in a convenient rebuild kit. 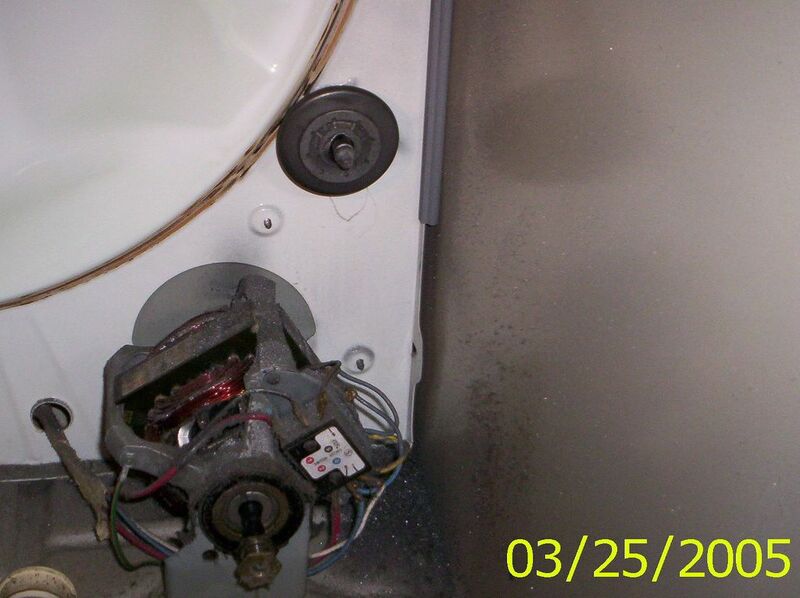 This entry was posted in Dryer Repair, Washer Repair on March 28, 2005 by Samurai Appliance Repair Man. I recently bought a used GE heavy duty dryer. We immediately noticed black marks on all our clothing. They look like they have been pulled into the wholes and burned. They will not go away no matter how many times you wash them and with what. The top of the dryer also gets rather hot during use. Any clues as to what the problem may be?? You have several clues right on this page! You left one other reason for black smudges off your list. Teenage boys who leave black ink pens in the pockets of their cargo pants (have you ever known an overworked mom who can properly look through those pockets? And what about the wads of tissues the family leaves in there?) Please suggest a suitable punishment. There’s only one punishment: make THEM repsonsible for all the laundry. You still control meals, right? I have the same problem with black smudges with my Maytag Model GDE412 dryer and the rumbling like tennis shoes in the dryer. The recommended repairs sound complicated. Are they all necessary? Should these be left to a professional? If so, how much would it typically cost? I have very average technical skills – can change oil in car and change alternator. Ed, for your problem, you’ll need to open up the dryer and inspect both the drum rollers and the blower wheel. Thanks so much for the quick response . . . guess you think it’s fixable by me. I’ll begin opening the dryer! Sheeeeit, it’s plug n’ chug, mah bruthah! For me, it’d be two mugs on the patented Suds-o-Meter. Accounting for your inexperience in such matters, I’d reckon you might require an extra mug for the learning curve, an’ all. I have the same problem. I just ordered replacement drum rollers. Any advice on how to remove the black marks? The black marks should come out in the next wash. May need to use stain/spot remover.